Canada is home to almost one million people with a Filipino background. Naturally, this means there is a considerable amount of interaction between the two countries at the personal and corporate level. Every year, tens of thousands of documents are exchanged between the two countries for purposes such as citizenship, employment, inheritance, business partnership, expanding existing subsidiaries, or merging with a Filipino corporation. However, there must be a way of checking to make sure that documents issued in foreign countries are legitimate. Since it is not convenient for both countries to have a detailed record of documents such as birth certificates, marriage certificates, police checks, certificates of incorporation, articles of incorporation, corporate powers of attorney, International Trade Certificate or Good Manufacturing Practice from the other, a simple verification process was developed. You may have heard of an apostille before, but neither the Philippines or Canada have signed the Hague apostille convention. As such, Canadian documents need to go through the original process of authentication and legalization. The same is true for Filipino documents that need to be used abroad, but this article (and our services) is only concerned with Canadian documents that need to be used in the Philippines. Therefore, if you have been told to get a Canadian apostille for the Philippines, this is not possible. The authentication and legalization process is equal to an apostille and is required for almost every Canadian document that needs to be used outside of Canada. For a Canadian document to be valid for use in a foreign country it must contain the following two signatures: one from any agent at Global Affairs Canada and another from consul of the consular section of the Embassy of the Philippines. The first signature from Global Affairs Canada is the step of authentication. For authentication of a Canadian document to take place, it must have the signature of an authorized individual who can attest to the validity of the document such as a lawyer or notary public. Some other documents such as RCMP police checks, birth certificates and other vital statistics documents are issued with signatures that are already recognized by Global Affairs Canada. There are additional requirements that need to be met before an agent at Global Affairs Canada can stamp, sign, and seal your Canadian documents and they can take up to 20 business days to authenticate documents they receive. Next, your documents have to go to the consular section of the Filipino embassy which is also located here in Ottawa. They also have their own requirements and fees that you must provide and these are subject to frequent change along with their own processing time. They look for the signature of one of the agents from Global Affairs Canada and attach a certificate containing their own stamp, seal, and signature on the document which makes it valid for use in the Philippines. It is clear to see that this process is quite the mission and it is arguably impossible to do correctly on the first attempt even for those familiar with the process. The chance of delays are very high and the associated loss of time and money become very apparent not long into the process. This is why we developed a cost-effective alternative: ALSC. First, one our agents will assist you in ensuring your documents are ready for authentication at Global Affairs Canada. Second, your agent will ensure that you provide all the necessary requirements for legalization at the Filipino consulate. Third, you will be able to choose your authentication speed from our three service speeds: priority same day, standard 3 business day, and economy 10 business day services which can save you up to 20 days of processing time. Fourth, your agent will assist you in completing your order forms and preparing them along with your documents for shipping to our head office. Instead of going to the post office to send your documents to our head office here in Ottawa, you can choose to drop them off at one of our many service centers across Canada. These service centers located in Winnipeg, Toronto, North York, Calgary, Edmonton, Regina, Mississauga, Halifax, Victoria, Vancouver, Surrey, or Montreal allow you to receive free shipping via FedEx to our Ottawa office for processing. We can even ship your documents back to any one of our service centers for free via FedEx for pickup upon completion. If you are interested in this option make sure to contact us first! If you show up without an appointment we may not be able to accept your documents and you will almost certainly cause delays since you will be missing critical requirements for the process. Finally, you relax and we take care of the rest. You will receive detailed updates at every stage and our agents will be available always during our operating hours to answer any questions or address any concerns that may arise. If you have Canadian documents that need to be used in the Philippines, contact us, especially if you have a deadline to meet in the Philippines. Continue reading for more details about different Canadian documents commonly requested for use in the Philippines. There are a variety of reasons for which you will need to authenticate and legalize your Canadian corporate documents for use in the Philippines. These include but are certainly not limited to partnering with Filipino corporations, modifying existing corporate structures, or putting Canadian products on the Filipino market. The documents in question can range from corporate power of attorney, board resolution, and authorization letters to GMP certificates, ITC certificates, CPP certificates, and numerous incorporation documents. The exact documents you will need will depend on what has been requested of you by your affiliates in the Philippines. Ensure you clarify exactly which documents you require as poor communication is one of the greatest causes of delay. As an existing business you probably have some experience getting these documents for other purposes within Canada and likely have many of them on file in an accessible location or at least know how to get them. As you may already know, corporate documents require notarization by a lawyer or notary public in order to be valid for authentication at Global Affairs Canada. Lawyers can also draft documents such as corporate powers of attorney for you at an additional cost. If you have these documents ready to go, take a minute to make sure the stamp seal and signature from the lawyer or notary public are all legible and from the same person. If a seal is missing or if they do not match, the document will not be accepted for authentication at Global Affairs Canada. This is another common point of delay. There are some cases where processing original corporate documents for authentication and legalization is not ideal. This can be because the documents cannot risk being damaged or lost, or are simply very tedious to have reissued. In these cases, notarized copies are preferred. Prior to making these, remember to check with your requesting party in the Philippines if notarized copies will suffice for your purposes. If you need documents such as articles of amendment or articles of amalgamation for use in the Philippines, you can get started on getting them by clicking here. Canadian vital statistics documents such as birth certificates, marriage certificates, and death certificates are some of the most commonly requested documents for personal affairs in the Philippines. These can be requested of you for reasons relating to employment, immigration, marriage, or inheritance. As mentioned earlier in the article, Canadian vital statistics documents contain signatures from Global Affairs Canada which makes them valid for authentication upon issuance. They do not require any additional processes such as notarization by a lawyer or notary public. Notarized copies can be made but are not recommended as it is usually less expensive to simply order another birth certificate, marriage certificate, or death certificate than make a notarized copy, especially since originals are always preferred for processing. There are also two additional things to note. First, the marriage and death certificates must be those issued by the provincial vital statistics department. Marriage certificates issued by the church and death certificates issued by the funeral home cannot be processed even if they are notarized. Second, long form versions of these documents are preferred wherever possible and wallet sized documents such as birth certificates cannot be authenticated by Global Affairs Canada. Long form birth certificates may be referred to as a copy of an act of birth or a registration of live birth depending on the issuing province. Make sure to check this carefully before ordering a new vital statistics document if you need to do so. Furthermore, you can arrange to have your new birth certificate, marriage certificate, or death certificate shipped directly to our office to save you processing time. Many of our clients choose to do this and we recommend you do the same! Please contact our head office beforehand to prevent any confusion or delays if you are interested in doing this. Refer to the useful links below to order your Canadian vital statistics document from the province in which the life event occurred. Authentication and legalization can be a very difficult process. It requires not only extensive planning, work, and attention to detail, but a thorough understanding of all the different requirements, preferences, and potential delays at Global Affairs Canada and the Embassy of the Philippines. Clearly this is a job in itself, and most individuals and businesses have their own jobs to attend to and do not have the time to try to learn a process which is not possible to practice. Considering it is a process that is only known about once it is requested, there is a lot of confusion which arises especially since many advisors such as lawyers do not know that Canada does not have an apostille process and will insist that you get one even though it is not possible. This happens quite frequently and only adds to the confusion of trying to address your foreign affairs. This is why you should trust us, the original experts in making Canadian documents global. Tens of thousands of Canadians have done exactly that and our A+ rating with the BBB, recognized membership with the Canadian Chamber of Commerce, and numerous 5-star reviews make it clear that they were happy that they chose ALSC. Our services are the best option when it comes to authentication and legalization. 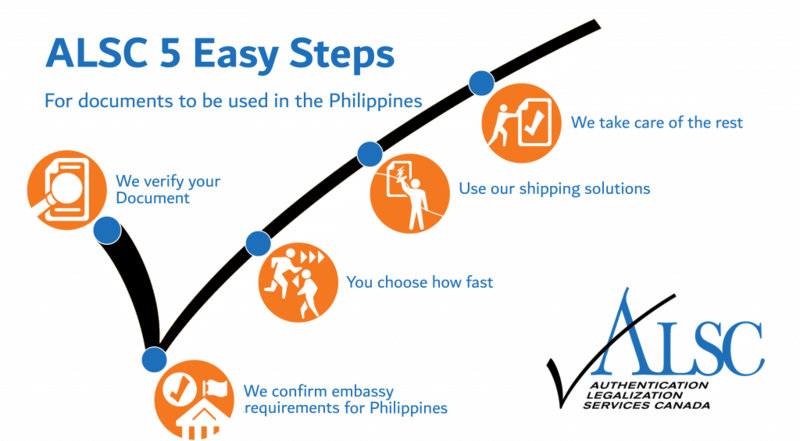 Our service guarantee ensures your documents will be valid for use in the Philippines and our experts work hard to minimize every possible delay and make the process as efficient as possible. Save money in the long run and time in the short run, trust ALSC with your Canadian documents in the Philippines and experience a professional, stress-free service unlike any other. Click below to get started!